Photo taken 5th August 2007, Whitby. Cabbage growing wild on the cliffs at Whitby where it is very common. Cabbage has been in cultivation for so long this may not be true wild cabbage, but rather an escape from cultivation. True wild cabbage is a native of the south west of England, where it grows on rocky coastlines. The ones at Whitby are certainly behaving like their wild ancestor! What a beautiful looking plant this has become. So if you grow your own cabbages, whether wild or a cultivar of any type, remember that the entire plant is potentially edible. Some varieties are grown for their flowering peduncles (cauliflower, broccoli), some for their leaves and kohlrabi for its stalk. So it's worth experimenting with these psrts on other types of cabbages. For instance if you grow broccoli, the young leaves (and not so young - it's surprising for old they cn get before becoming unpalateable) are good either cooked or in salads. 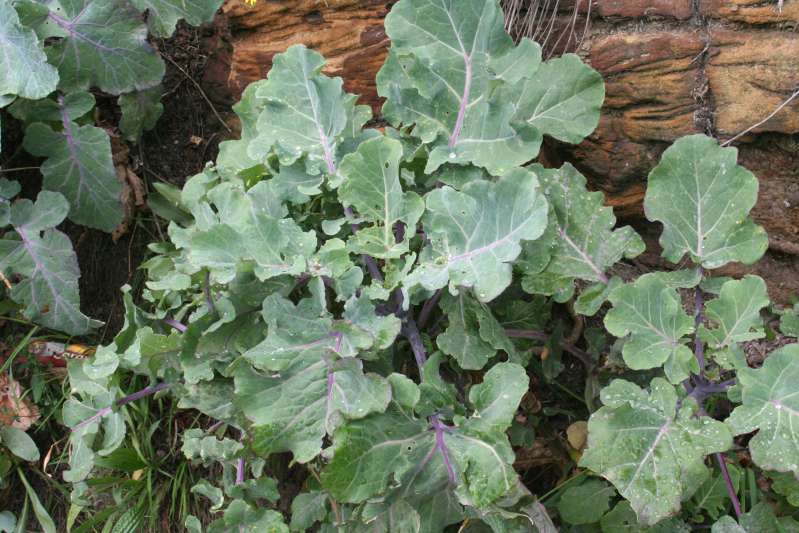 Kohlrabi is not the only variety where the stalks are palateable - though if you cut the stalk too far down, the centre becomes hard and woody and unpalateable. Above this, simply peel the outside layer. Brussels sprouts have been developed for their secondary sprouts. But if you cut any cabbage and leave the cut end to grow, you will get side shoots which are very often a very good second crop, particularly in early summer. A tip with Brussels sprouts: never buy them loose, always on the stalk. stand the stalk in water in a cool place and the sprouts will keep fresh for weeks. Fresh, just off the stalk, they are delicious raw and need very little cooking. The same method works fine for other brassicas - and other veg in general! One advantage of wild cabbage is that it tends to have a stronger flavour than most cultivars.